I have been doing internship hunting and job applications all afternoon long (except not really because I found myself procrastinating way more than I usually do). The whole "stumbling" thing is starting to become a serious problem. Nevertheless, it helps my blogging career. Ok, so the original plan for today was a crispy chicken recipe (one which I will not share today so that I don't spoil a future post), but I forgot that the chicken in my fridge had been there for almost a week. So because of my lack of organization I had to resort to a back-up quick recipe. Pasta. I need to make it clear that I won't usually make pasta dishes because every time I make one I feel like I am missing something from my dinner. I used to be a pasta lover, but I have realized that it doesn't satisfy me as much as it did before. I end up full but not content. The thing is though that pasta is easy and usually pretty quick. Because of that and the fact that I had tagged several yummy-looking pasta dishes I decided to make some for dinner. 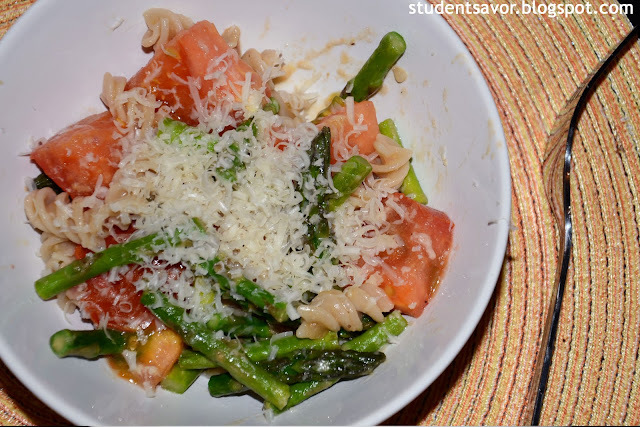 The original recipe was only with asparagus and cheese, but there was a lonely tomato about to go bad in my fridge so I decided to incorporate it. Cook pasta according to instructions. Drain and set aside. Heat oil in a large saucepan over medium high heat. 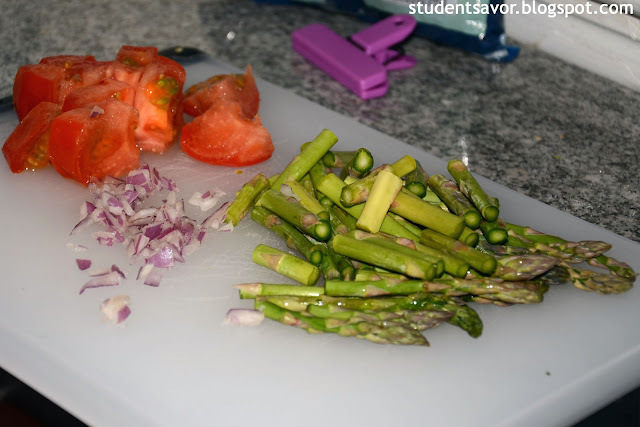 Add asparagus and season with S & P. Cook for about 3 minutes or until tender crisp, stirring occasionally. Remove from heat and set aside. Keep saucepan warm and add chicken broth, onion, lemon zest, and lemon juice. Cook for about 6 minutes, or until sauce is reduced to about 1/2 cup, stirring occasionally. 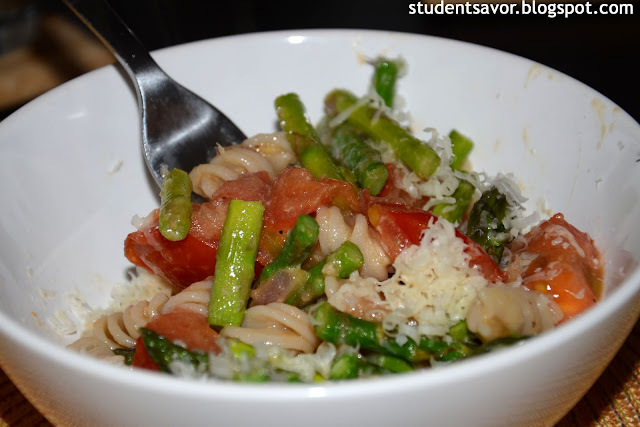 Reduce heat to low and add tomato, asparagus, and cheese. Mix until combined and remove from heat. Serve topped with freshly grated or shave cheese.